OAI's involvement with industrial supply began with a 2001 phone call for our assistance with a seafood processing well and has expanded to wells associated with cooling water, process water and mining water. In all, since that first call, OAI has completed six hydrogeologic studies that have resulted in the development of 10 industrial supply wells capable of producing 10.5+ million gallons per day. The following five case studies highlight some of these industrial supply well projects. OAI's first industrial supply well project was a high volume well located within Alabama's coastal zone. The client was referred to OAI due to our expertise with permitting coastal wells. The project required a hydrogeologic work-up to support development of a new replacement well, aquifer testing to determine aquifer hydraulics and groundwater modeling to evaluate the well's potential to cause saltwater encroachment and its impact on other area wells. 50-year capture zone. OAI’s hydrogeologic effort determined no other wells were completed in the aquifer, saltwater encroachment would not occur and permitted this 196-gallon per minute well. Initially permitted in 2002, the well continues to provide the needed groundwater supply. This OAI client's product was in demand to the point the plant was expanding to double its production capacity. This expansion brought with it the need for additional industrial water for use in the manufacturing process and for use as a potable source of supply for plant employees. OAI was retained to complete a hydrogeologic study of aquifers underlying the site with the intent to develop an additional source of groundwater supply. Once a target aquifer was identified, OAI completed wellsite services and assisted the facility in permitting the well as both a source of industrial and potable water. The project was successful in identifying an aquifer, developing a new 1,000 gpm well and permitting the well. This OAI client was paying a local utility for its entire cooling water supply since the plant's construction after having been told groundwater "is not an option" in the area. The client was referred to OAI by their engineer who was familiar with OAI's groundwater exploration and development efforts. Initially, OAI was retained to complete a hydrogeologic study to determine if any aquifers were present. The hydro-study identified five aquifers underlying the plant site. Of the five aquifers, one was targeted for development due to it having acceptable water quality and it not being used as a source of public water supply in the area. The aquifer was tested and found acceptable with respect to water quality and quantity as proposed in the study. A 710 gpm well was completed in the aquifer and permitted for use as a source of industrial supply. Since 2005, this well has provided industrial supply water for this facility significantly reducing the plant's purchased water expense. OAI met with this client to discuss their expected groundwater needs. In Phase 1 of this project, OAI completed a hydrogeologic study covering 30 square miles around the client's plant. The study identified several aquifers and presented proposed drilling depths to test the aquifers identified. Drilling and test wells found the targeted aquifers present as mapped and with water quality meeting the requirements of its intended use. Land purchase followed and two separate aquifers were tapped by two production wells. To date, the wellfield has two "test wells" capable of supplying a combined capacity of 756 gpm and two production wells, photo below, capable of 1,500 gpm each for a current wellfield total production potential of 3,756 gpm (5.4 mgd). A third aquifer has yet to be tested but should easily be capable of an additional 1,500 of industrial supply. Each aquifer may be capable of supporting additional wells based on testing to date. This industrial client retained OAI to explore the potential of developing an industrial source of supply at their facility after hearing about OAI's success in developing a groundwater source of supply at an adjacent plant, see Case #3 above. OAI completed research and identified two aquifers with the potential to meet their needs. 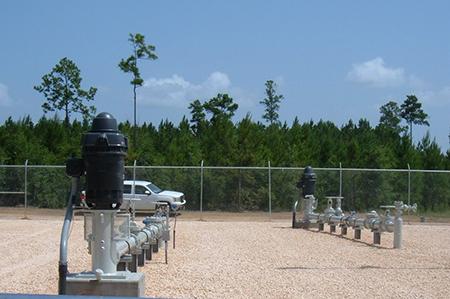 The aquifers were drilled, tested and permitted under Alabama’s Coastal Zone Regulation with 300 gpm and 600 gpm wells. Daily savings generated from use of these two wells reduced this plant's purchased water expense by about $1,100 to $1,300 per day beginning in 2006 when the two wells went on-line. In 2012, a review was initiated by OAI to determine whether or not a third well can be completed at the site without adversely impacting operation of the two existing wells. The review was favorable with a third well completed at the plant in 2013 and permitted for 800 gpm. Discussion with this client initially began in 2009. After years of start and stop, OAI was tasked with assessing this client's industrial supply. The assessment didn't offer much hope for additional development at the site but did offer an option never even considered by the client. Authorization was given and OAI submitted a plan to test a new concept of groundwater production. The test program was implemented as planned. The result found tremendous production of high quality water, dubbed "holy water" by the client, was sustainable. Plans are currently underway to develop a four well wellfield capable of producing up to 5.6 MGD. OAI's research and persistence led to this project moving forward. In many of OAI's industrial water supply projects, our clients were initially given incorrect information or miss-informed on the availability of groundwater in the vicinity of their plants. OAI's track record shows that it could be to your benefit to get a second opinion on the groundwater option if you have been told groundwater is not an option. Contact OAI today to find out more about the potential of developing a groundwater source of industrial supply for your plant.